New homeowners find themselves with a lot of additional expenses: repairs, furnishings, changes in utility bills, appliances -- it's a seemingly endless list. While homebuyers should be prepared to take on these new costs, a thoughtful house-warming holiday gift can go a long way for someone in the midst of this life change. We asked some gift and home experts for their thoughts on presents for new homeowners, and they focused on useful gadgets, especially those that can save money and improve energy efficiency. 1. Hardware Store Gift Cards: Hanging picture frames requires a hammer and nails. Assembling furniture usually involves a few tools, and let's be real, the tiny wrench and Allen key that come with the item aren't the easiest things to use. Running out to the hardware store every time a project requires a new tool can get expensive, but it's part of settling into a home. You may not know the state of your friends' toolboxes, but you can still help them out by giving them the money to expand it. Find out which hardware store is nearest to their new place - that gift card will definitely get used. 2. Clever Little Things: Gifts with a personal touch can make a house more homey, and you don't have to sacrifice style for utility. Trae Bodge, senior editor of the Real Deal blog by RetailMeNot, suggested some good-looking touches that will help a new homeowner stay organized and comfortable. In any living space, it's easy to lose track of your mail, keys and little trinkets. To avoid the stress of misplacing small, important items, Bodge, who tests and reviews gifts for a living, suggested the charging station/valet from Red Envelope and key and letter holder from the Container Store. "What I really like about it is that in addition to serving as a catchall, it's also a stylish charging station for their smart devices," Bodge said about the charging station. And she chose the key and letter holder for its chic appearance and simple function. "It's [a] great basecamp for new mail, and it's a magnetic key holder so they'll always know where their keys are." With everything that's going on during a move, it's easy for someone to overlook the little things, like giving people the new address. 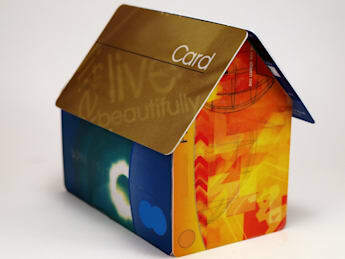 Scott Sheldon, senior loan officer with Sonoma County Mortgages and a Credit.com contributor, said a personalized stamp with the person's name and new address is a great gift - it comes in handy for sending "We've Moved" letters and holiday cards. 3. Appliances: Not everyone's budget allows for big purchases, but there are some higher-priced gift ideas that could be incredibly helpful to new homeowners. Energy-efficient additions to a home will be useful in the short term -- by taking expenses off the homeowner's plate -- and long term, when it comes to paying utility bills. Chris Birk, a Credit.com contributor and executive editor of Veterans United Network, suggested giving energy-efficient appliances and fixtures as housewarming gifts. "Programmable thermostats can help busy homeowners save about $180 a year in energy costs, according to Energy Star," he said. Speaking of staying warm, Bodge added a snuggly blanket to her list of suggestions: "The sofa comforter from Brookstone has a pocket for their feet and both a smooth and a furry surface to choose from," she said. "It's so comfy that my husband, daughter and I (literally) fight over it at movie time." These don't all have to be expensive items: There are small things, like energy-conserving outlets and faucet aerators that slow water flow and reduce waste. And you don't have to buy anyone a washer and dryer to feel good about your gift-giving. Think about what they like and ask what they need. A Blu-Ray player, lamp or nice coffee maker (Bodge recommends the Keurig Mini Plus Coffee Maker) can be a welcome addition to a new home. Bonus Item: A Shovel (That's right. A Shovel.) "Some years will be worse than others, but it's safe to bank on spending about 1% of your home's value on maintenance each year," said Birk. "First-time buyers in particular can be caught off guard during the transition from renter to homeowner, as the luxuries of a snow-shoveling landlord disappear." Think of it this way: Your friend can't clear their driveway with home decor, so while a shovel may seem like a weird gift, he or she will get more out of it than a random wall ornament.